In honor of Men’s Health Week, we are pleased to present a guest post by PatientsLikeMe member tiredoftired, a young man who has been living with major depressive disorder since 2007. Don’t miss this moving essay about how Mike Wallace’s passing earlier this year impacted and inspired him. 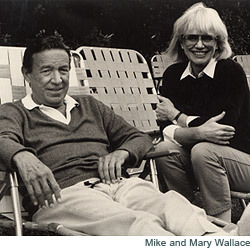 As I was driving to therapy on an April afternoon, I heard a news report that Mike Wallace, an original host of the television show 60 Minutes, had passed away. I was intrigued when the short segment highlighted Wallace’s accomplishments in his battle with depression. I was only somewhat familiar with the show, but it was obvious from the report that he had a decorated career as a journalist and his professional accomplishments could have easily taken the full slot. Having struggled with depression myself, I felt compelled to investigate his life further. For those of you who are unfamiliar with his work as I was, Wallace was a pioneer of the newsmagazine format, which shaped journalistic television. He was a pit bull of a correspondent; with his aggressively confrontational approach, he posed direct questions that others were too afraid to ask, often leaving the subject shaken. Wallace interviewed some of the most eminent, and even fearsome, people and did not hold back on his interrogation-like technique. There is no shame in depression: Wallace constantly repeated that depression does not signify an emotional weakness. The pain, inability to cope and despair are unfathomable to those who have not experienced depression. It is not a sadness that is surmountable by sheer willpower. Aside from reassuring sufferers that their pain and disabilities were justified, it comforted them by seeing someone well-respected using his high-profile position to dissolve social stigma. There is no shame in asking for help: The stigma can prevent people from seeking help and make them embarrassed that, unlike others, they are unable to push through sadness themselves. Wallace said that the single most important thing you can do is to go and talk to someone. He stressed that it is impossible for one to handle alone, and he encouraged people to seek therapy and take medication, as well as emphasizing the importance of social support from family and friends. You are not alone: During depressive episodes, Wallace often talked to two close friends that also experienced depression. By talking to those who could truly empathize, he felt comforted and validated. Not only was he reassured that what he was feeling was normal, they were able to give him valuable insight and ideas. There is a light at the end of the tunnel: Wallace’s friends also gave him hope. He saw that they had been through the darkness of depression and survived. And he passed along that message to others. As bad as it seems now, he told people, look at how he emerged from that same prison and went on to live a happy, productive life. Mike Wallace has inspired me to perpetuate these messages and give others the same comfort and hope he gave me. Depression is a real medical illness and pursuing treatment is nothing to be embarrassed about. With the help of mental health professionals and a strong support system, we have the ability to fight through the darkness. By doing that, we can do more than just survive – we can build productive and meaningful lives. Learn more about Mike Wallace’s struggle with depression in this candid CBS interview from 2006. Also, if you’re living with depression yourself, we invite you to join PatientsLikeMe’s depression community and connect with more than 11,000 others like you.